I have always loved the first week of school. There is this exciting feeling of another new start, new things to learn, and new ambitions that makes one ready to whole-heartedly dive into whatever the year has to hold. I am not embarrassed to say that I still do “back-to-school” shopping every year! The main reason I love back-to-school season is because the PNB Community Education Department hits the ground running (or should I say dancing!) at full speed. 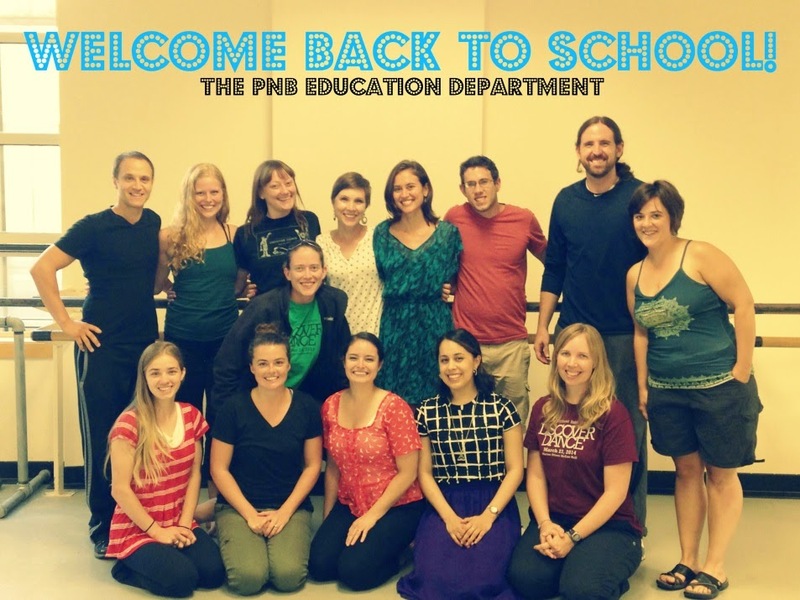 We have such a talented, intelligent, and passionate group of teaching artists and accompanists whose excitement about being back in the classrooms is completely infectious. It is impossible not to soak up their joy and eagerness. Every year we have different students, maybe different teachers and principals, but that enthusiasm never goes way. Our biggest program, DISCOVER DANCE, started last week. This residency program introduces dance to students and schools that otherwise have no dance education programming. Entire classrooms work with one of our teaching artists for 3-4 months, learning dance vocabulary and choreographic basics in order to create a dance. Each classroom choreographs a final piece that integrates curriculum they are learning in another subject area. We have seen dances based on science, math, stories, and social studies. The best part is seeing these students taking ownership of their part within their dance as well as an increased desired to express oneself through movement. This year we have 37 participating classrooms, 940 students, 54 teachers, and 14 different languages within our 11 DISCOVER DANCE partner schools. All in all this will mean over 1,200 instructional hours this school year! I visited some of these schools last week and students still remember, with great pride, the dance they created with their classmates, acknowledging that it took diligence, collaboration, and practice to get performance ready. They all still enjoy and connect to dance. With lasting impressions like that, how can I not be excited for this time of year every year? Seeing students (including sports-loving boys!) leap as they exit PNB Studios after a fieldtrip, because they were inspired not only from their dance class, but also from watching PNB Company dancers during rehearsal. Hearing a student explain that music is necessary because “it gives dancers emotions”. Students asking, “You mean, someone like ME, can dance? Someone like ME can be a dancer?” I have heard that from students of every age, race, physical ability, and gender. It is inspiring to hear PNB teaching artists, dancers, and partners look those students in the eye and say, “Yes, dance belongs to everyone,” every time. The moment when audiences cheer for our students at a DISCOVER DANCE Performance at McCaw Hall or at their school. Seeing families and friends bursting with pride after the performance is also pretty unforgettable. Hearing gasps, “ooooohs”, and loud cheers when the curtain comes up on the McCaw Hall stage during our EYES ON DANCE Student Matinees. I love seeing Nutcracker, Don Quixote, or Snow White through the eyes of students; watching the audience is just as magical as watching the dancers on stage. The reverence every student gives when visiting the costume shop as well as the sincere, thoughtful responses every worker gives when peppered with questions. Students who begin to connect with their peers and teacher, understand a subject, or gain self-confidence because of what they gained in dance class. Observing our ten teaching artists throughout the year, seeing how they grow as artists and teachers. Their dedication to the work and students they serve is vast. Every year we face various challenges within the classroom and outside of it (new principals, new teachers, limited resources, etc. ), but that’s what working in arts education has taught us. You dive in, you get confronted with new things, you work harder, you learn, and grow. I’m so proud of PNB being a part of Seattle Public Schools’ new Creative Advantage arts education initiative; the ability to reach more students, teachers, parents, and communities, is there. Every student should have access to an arts education, to know that dance is a part of them. Movement is innate to us as humans, dance is not exclusive, and it belongs to all of us. Through the Creative Advantage we are working so that every student can dance. Is our team ready to dance with them? To which I can only respond in true, back-to-school spirit: Yes, let’s begin.